I'd just like to congratulate Dan on discovering the most boring possible arrangement of 41 words that the world has yet to see in the previous blog post. I know he's been spending a lot of time lately working on becoming even duller than ususal, and it just makes me so happy that he's decided to share the fruits of his labour with us. 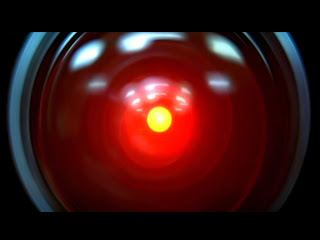 Look out HAL, the world has a new sentient computer that will soon take his place in the history of cinema. He wouldn't hesitate for a second to cut out my life support systems either if he could. DV: An editor is me? Dan Voshart: if anything in this documentary is technically competent its because I've shot it or made an effort to get clear sound. I'm a cinematographer by trade and, in a years time, will drop everything for a New Zealand dream. Chris Ciosk: If anything in this documentary doesn't feel like it was produced by a sentient computer-being it's probably because I was involved. I'm a writer-director and relatively infrequently an actor, and I'm excited to be turning this quest of mine into a film.